Above left: Picture-wing flies Urophora stylata. A widespread species on spear thistle. Above right: Ian Cheeseborough teaching bee identification skills. Below left: Andrena clarkella female. A mining bee. One of the first bees to emerge each spring. The female gathers pollen almost exclusively from goat willow and other Salix flowers. Below right: A widespread, though rarely common, snipefly Chrysopilus asiliformis. Fresh specimens are clothed in irridescent golden hairs. Workshops and advice on managing land for native bees and other insects. 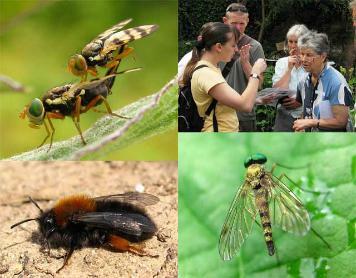 Identification workshops for bees, wasps, ants, hoverflies and other insects. See the Downloads section for examples of work we have undertaken.